These are the models in that I've been working on. they are not final but before I go any further I need to now if i go in the right way. the tower is a mix between an victorian clocktower, a starbase fort and a da vinci's tank design. It can have an animation turning the entire turret structure towards the target and another animation of just the cannon row rotating while is firing. 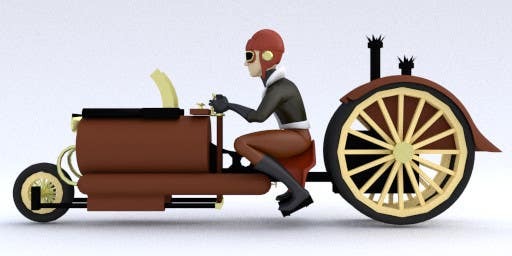 The steam motorcycle could also include a sidecar and not so modern machineguns. I will add much more detail, like pipes, gears, rivets and stuff. I was thinking for the textures make them kinda dark and desaturated, like a gothic style, the colors are figurative, reflective yellow for brass, dark red for bricks, grey for stones, brownish red for rust, etc. textures will be bumpmapped also. just want to know if I am not losing my time. Thanks in advance. Thanks for your submission, you are definitely on the right track! I like the idea with the sidecar, could you please add one? This will make the area used by the unit more squarish. Regarding the tower animation I am fine with what you described. For the rest just go on as you described.